Over summer 2015 we started to assemble and draw this ‘memory map’. It was inspired by comments on the York Stories Lost Layerthorpe page, the memories of residents who lived in the area in the 20th century. There’s a map and an accompanying key. Selecting the images below will enlarge them – the images will load on their own in new browser windows, and then you should get the option to enlarge/zoom in. There’s also a PDF version on the link below. Let us know via the comments if you spot any errors or important things missing. This is version 2 and includes additions following some of the comments made below. 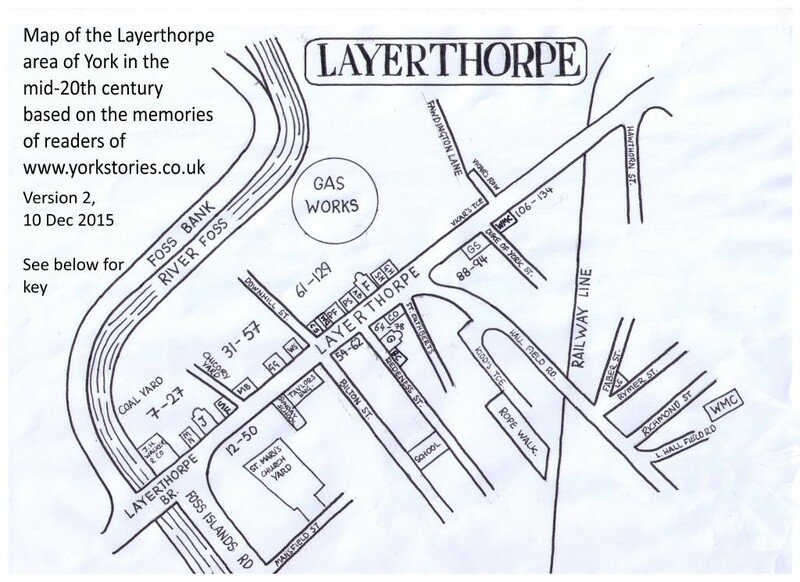 Map created by the York Stories Collective, based on contributions and comments by Trev Audin, Sheila Blakelock, Mike Clark, Sue Claxton, Quentin Gannaway, Trevor Keeler, Terry Morrison, David Poole, and contributors via the comments below, and with reference to the street directory reproduced in Avril Webster’s book on Layerthorpe. Particular thanks to Trev for starting the whole thing off and for the donation that enabled the creation of this Layerthorpe project website. My grandfather, Martin Durkin (who lived to be 103), owned Nos. 58 and 60 Layerthorpe until they were ‘Compulsory Purchased’ from him about 1960. Can you mark the York Boys Club as next to the pub in Redeness st. It was a great place for all the young lads in the area. I remember we had a visit from one of the Royal Princes but don’t remember which one. Hi David thanks for that. Can you remember anything more about it? Ther must be pictures of that and other events. It would be good if ther could be a gallery of residents. Maybe old pics and more upto date ones might be a worthwhile addition to the site. Dennis is my dad. Still alive and 91 now. My mother is coming up 89. We lived at 27 Redeness Street until I was 11. I went to Bilton Street School until it closed in 1956. My grandad, Martin Durkin owned Nos. 58 and 60 Layerthorpe. He lived there too and died aged 103. Didn’t know you lived at the corner shop Terry. Was that before or after Mrs Coates took it over? Remember the Key’s had it too. I lived down Redeness Street most of the time. Granny and grandad Durkin and my dad’s brother and his family lived on the ‘front’ of Layerthorpe in the two houses near the corner shop. 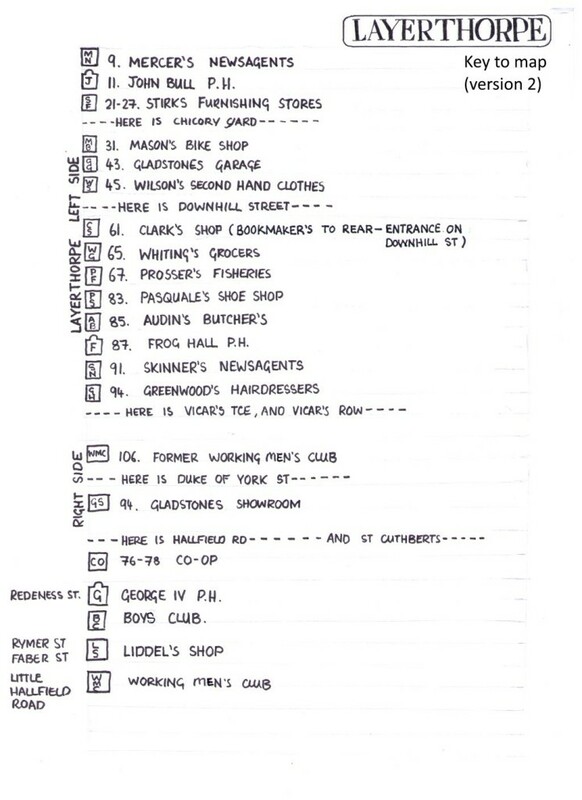 Terry, I have just been looking at the ‘Key to the Map’ and it looks like your mum’s fruit shop has been missed off before the Frog Hall. Hi Sandra, you are right, also whiteings shop and was it costellos next door, I remember a ladie and two daughters they were a bit older than us. Yes Terry, the girls were Joan and Dorothy Costello. Joan used to babysit at our house occasionally. She was older than me but went to Premier Commercial School in Stonegate where I went to be taught shorthand, typing etc. They lived with their father. Not sure about Dorothy but Joan died a few years ago. I remember Norman and Doris Whiting too. They went on to have the deli in Bootham. Memories eh! Before we moved out to Dalby Forest we lived overlooking Monk Stray in York. Had some contact then with Jackie Mitchell (now Bean). She lives in Heworth. I am good friends with Barbara Jackson (now Milner) from our primary school days. Also met Jackie Brown at some point whilst there. She was working upstairs in Asda. Eric Richardson has grandchildren at my granddaughters primary school. Do you remember Gerald Lee. Attended a Christening at his the hotel on Holgate Road too. Our son is friends with Corina Jones brother in York. Oh, I could go on forever. Do you remember any of these? Hi Sandra, thanks for the information you’ve added in your comments above, we’ll have another look at the map re the shop you mentioned that has been missed off, thank you. Thanks David – we’ve now added Whiting’s shop to the updated map, above. I realised later that I’d originally noticed it in the street directory page in Avril Webster’s book, which has been very helpful. On the eastern corner of Layerthorpe/Bilton St corner(possibly no.52) was a bookmaker named Jock Cryle. The windows were blacked out & the door always closed. Betting could only be carried out officially by phone or post, but of course most betting was by cash under cover, often via public houses. The police occasionally visited the premises, presumably to keep those involved aware of the situation. Where was Morley Street??? My Nan and Grandad (George and Gertrude McSloy) lived at no 1… I remember visiting when I was very small… when looking out of the back bedroom window I remember seeing the tall chimney. And also the clinking of the trains from the rail line ..